A writer for the Washington Post then called me and tried to extract a statement he could use to discredit the story. I declined to give him anything, except a link to a key 2015 NY Times piece, which he said he’d “read many times.” I’m not sure why he had to read it more than once. Perhaps he suffers from a mental deficit. Anyway, here is the piece I wrote then. It’s more relevant than ever. Then I’ll make some comments on the present situation. —Cue the dawn sunrise and violins for the beautiful first couple of American politics (the Clintons). But what about the uranium scandal? Before I quote a NY Times piece on this—-suppose, just suppose the beautiful first couple, Bill and Hillary, have been running a parallel operation to the government, in the form of a Foundation that is taking in major chunks of cash from people who want (and get) serious political favors. Well, current news stories confirm that. We already know that. Putin wants 20% of uranium on US soil. That 20% is already owned by a Canadian mining company. The State Department is headed up by Hillary Clinton. Her Department says yes to the uranium deal. The kicker? Those Canadian mining executives, who wanted the sale to Putin to go through, donated millions to the Clinton Foundation. On April 23, 2015, the NY Times ran a story under the headline: Cash Flowed to Clinton Foundation Amid Russian Uranium Deal. If you’re Putin and you’re sitting in Moscow, and the uranium deal has just dropped this bonanza into your lap, what’s your reaction—after you stop laughing and popping champagne corks? Or maybe you never really stop laughing. Maybe this is a joke that keeps on giving. 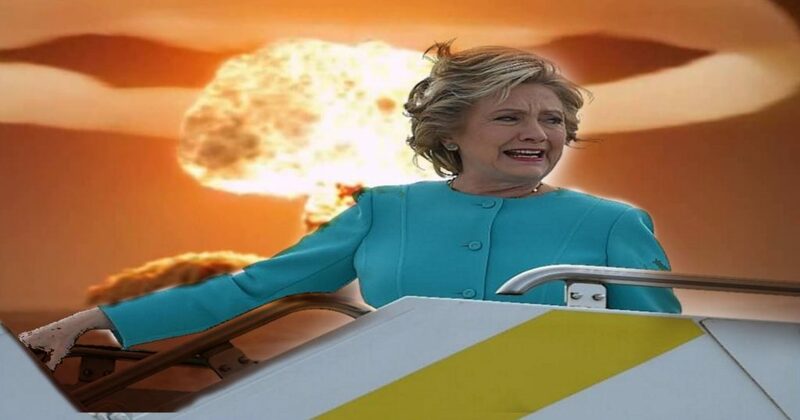 You wake up in the middle of the night with a big grin plastered on your face, and you can’t figure out why…and then you remember, oh yeah, the uranium deal. The US uranium. Who’s running the show in America? Ha-ha-ha. Some egregious dolt? Maybe he’s a sleeper agent we forgot about and he reactivated himself. And this Clinton Foundation—how can the beautiful couple get away with that? Can we give Hillary a medal? Can we put up a statue of her in a park? Does Bill need any more hookers? Final note: there is a great deal of difference between a major outlet like the NY Times running their Clinton/uranium piece for one day—and pounding on it for weeks and months. In the latter case, they would let loose the hounds, who would probe and push and interview relevant people and get confessions and parlay those confessions up the food chain—blowing the story into an enormous scandal—which it is. The Times had its hands on a volcanic piece…and they let it drop. Because the ceiling and the limit had been reached. The Times basically executed what’s called a limited hangout, a partial exposure of a story that was getting too hot to suppress entirely. The limited hangout allows the venting of steam—and then nothing more. In this case, the Clinton camp denies there was any quid pro quo, they assert Hillary had nothing to do with the uranium deal, and the curtain falls. Thus you have the reality which the major media did expose, vs. the reality they could have exposed. The “could have” part would have changed current history—but it was squelched, and put under wraps. Tossed on the junk heap. As Newsweek reports, that early FBI probe was launched under FBI Director Robert Mueller. Mueller is now trying to dig up (or invent) every tidbit he can about Russian collusion with…Trump in the 2016 presidential election. My, my. Newsweek contacted the FBI a few days ago, asking whether Mueller had informed the Obama White House about his old FBI probe that uncovered Russian corruption relevant to the uranium deal that was being put together at the time. This should be the subject of screaming headlines from mainstream news around the world: FBI CLAMS UP ON URANIUM DEAL. FBI REFUSES TO SAY WHETHER BOSS MUELLER TOLD THE WHITE HOUSE ABOUT RUSSIAN CORRUPTION IN URANIUM DEAL. FBI COVERING UP CORRUPTION IN CLINTON OBAMA RUSSIAN URANIUM DEAL. However, the FBI refusal is buried deep in mainstream stories. The gag order and the non-disclosure agreement are nonsense. They don’t apply when enforcing them would cover up a major crime. I have suggestions for the FBI informant’s lawyer Toensing, if she’s playing it straight. Hire at least four top-flight private security firms to guard your client around the clock, and hope these firms don’t have strong ties to government law-enforcement. Issue a firm declaration from your client stating he is in good health and has no intention of committing suicide. After all, it’s the Clintons we’re talking about, and Obama and the FBI. And, of course, the Clintons.